The Leanin' Tree company was established in 1949 by Ed Trumble. The company orginally sold greeting cards through the mail to farmers and ranchers. The cards carried delightful images of the west and soon garnered a following from around the world. In addition to selling cards, Mr. Trumble was dedicated to promoting western art, and used the proceeds from the greeting cards to built a premiere collection of western art which is on display at their gallery at 6055 Longbow Drive in Boulder. 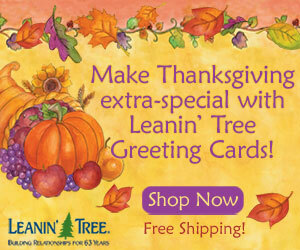 The web site allows you to browse through the Leanin' Tree collection of cards. I love the humorous cards which really show the best in western humor. They also have a great selection of premium cards that reflect the sentiment of the occasion. The web site includes features that allow you to upload photos for inclusion in personalized cards and an eCard feature that lets you exchange cards online.